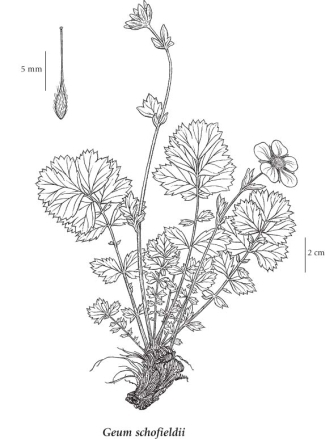 Perennial herb from a short rhizome and stout stem-base covered with coarse fibres; stems erect, 10-30 cm tall. Basal leaves several, stalked, interruptedly pinnately cleft with 5 to 7 cleft and coarse-toothed major segments, interspersed with several much smaller ones, the terminal segment the largest, 3-lobed or 3-cleft, coarsely toothed; stem leaves alternate, more or less unstalked, much smaller and less divided. Inflorescence of 1 to few stalked, terminal flowers; corollas yellow, wheel-shaped, the petals 5, broadly egg-shaped, shallowly notched, 10-15 mm long; calyces 5-lobed, the lobes lanceolate, erect, shorter than the petals, alternating with 5 narrowly egg-shaped bractlets; ovaries superior; stamens numerous. Achenes, numerous in heads; achenes spindle-shaped, 3-4 mm long, silky-hairy, beaked with the 7- to 10-mm long, persistent, straight, smooth style. Endemic to British Columbia. Considered by some authors to be of hybrid origin between G. rossii and G. calthifolium. Wet rock crevices in the lowland to subalpine zones; rare on the Queen Charlotte Islands and NW Vancouver Island; endemic.